Crossovers seems to be enjoying all the attention of late as almost every car manufacturer is busy churning out one. 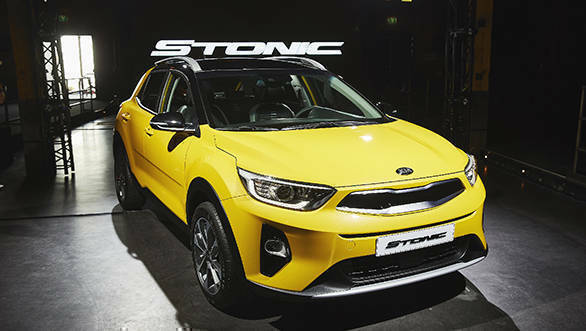 Last week Hyundai revealed the Kona and today the brand's sister concern, Kia unveiled the Stonic. Though there is no official word, it is said that the 2017 Kia Stonic shares its underpinnings with the Hyundai Kona. However, the main question that arises is why does the world need one more compact crossover? Kia states that close to 21 per cent of the existing hatchback owners are upgrading to crossovers that have a taller presence. And the Kia Stonic will target such customers. The 2017 Kia Stonic is based on the same platform as the Rio hatchback except that this one gets all the quintessentials of a crossover. 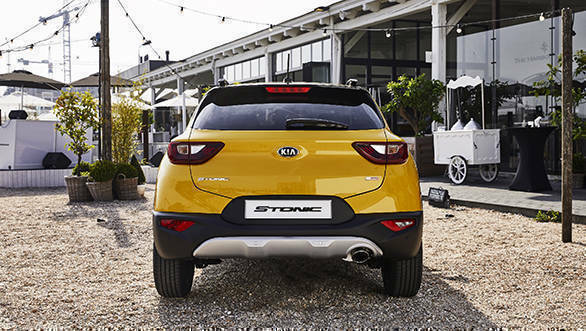 The 2017 Kia Stonic is designed in Europe in tandem with the company's Korean design studio. The crossover carries some of the peculiar brand traits such as the tiger-nose grille along with the sleek wrap around headlights with projectors. It gets a two-tone paint finish for the roof with up to 20 colour combinations and a choice of five distinctive colours for the roof. The side highlights the flared wheel arches along with the muscular shoulder line. It gets distinct bits like bright roof rails, body coloured C-pillar and the plastic cladding. The rear has been kept simple with compact lights and the muscular bumper done in plastic with an aluminium finished faux bash plate underneath. The cabin too will sport a similar theme as the exterior. Kia states that Apple CarPlay and Android Auto will be offered as standard across all variants. In addition, the 2017 Kia Stonic will also come equipped with heated front seats, automatic cruise control and keyless entry. The crossover is said to offer generous shoulder room, leg- and headroom. 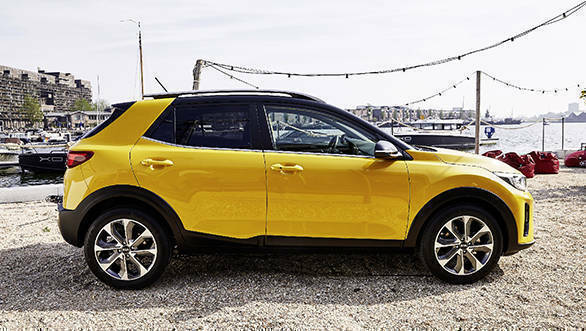 In terms of safety, the 2017 Kia Stonic comes equipped with autonomous emergency braking with pedestrian recognition and forward collision alert, blind spot detection (BSD) and lane departure warning system. In addition, the Stonic also comes with a high beam assist (HBA). Powering the 2017 Kia Stonic will be a range of lightweight, turbocharged petrol and diesel engines. There is Kia's 1.0-litre T-GDI (turbocharged gasoline direct injection) engine that puts out 120PS. There are also the 1.25- and the 1.4-litre naturally-aspirated MPI (multi-point injection) gasoline engines. Kia states that the 1.6-litre diesel engine that is one of the most efficient units in its segment offers the lowest emissions in the line-up. Kia has already announced that the Stonic will go on sale across Europe during the third quarter of 2017. Kia has already announced it plans to set up manufacturing plant in Andhra Pradesh. We believe the Kia Stonic will be one of the many offerings that the brand plans to bring in India.